While I was in Japan early this year, I was on the look out for retired and hard to find sets. I managed to find this one, and it looked incredibly cute! I didn’t get a copy while it was available from Shop@Home, so when I saw it on the shelf, I quickly snapped it up. It sounds strange, but I’m not sure what I paid for it, as I bought a bunch of other boring non-LEGO stuff and it was all in Yen! By the time I got home, I’d misplaced the receipt. It still remains a mystery! In any case, I’m glad I got a copy, as it was a fun little build! I’m sure my nieces will like playing with the puppy. The box is simple, showing a coupe of scenes of park life. The back of the box shows the alternate models that can be made. 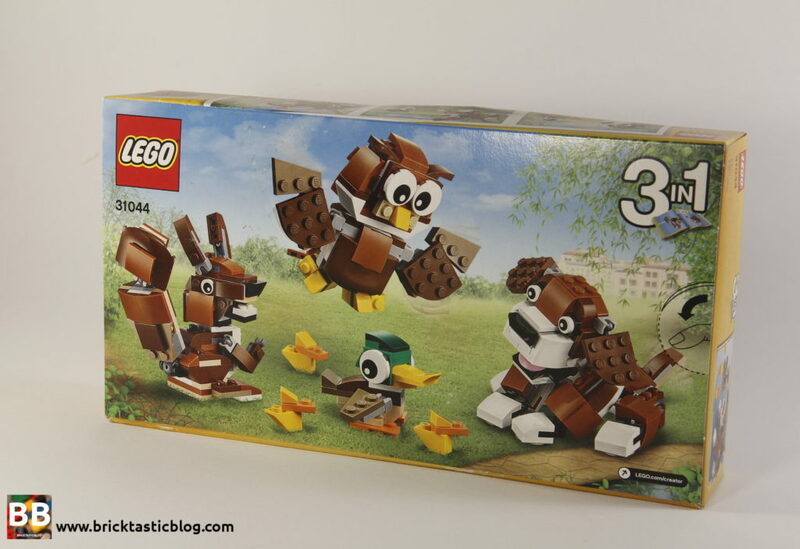 I’ve only put together the A-model, but there is also a strange looking squirrel and an owl that can be built. 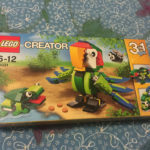 Inside the box are three un-numbered parts bags and three instruction manuals – one for each animal. There isn’t anything remotely rare or hard to find in this set when it comes to parts. 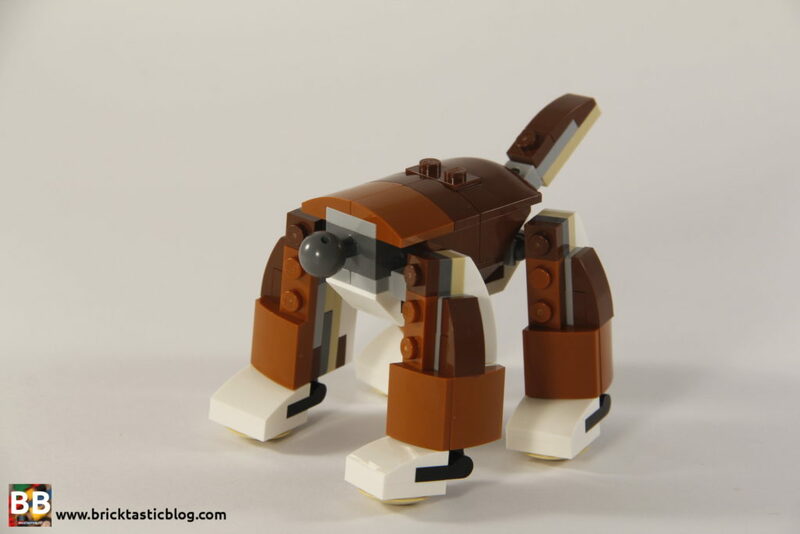 According to Brickset, the part that is in the least amount of other sets is the 3x4x2 bowed plate (used in the dog’s backside), which comes in 16 other sets! There is, however, a nice selection of browns, with reddish brown, dark tan and dark orange to make for a very appropriately coloured dog. There are also slide shoes as the dog’s paws and tongue, and plenty of slopes, including four white 4×1 inverted slopes, used in the dog’s legs, as well as a good amount of Mixel ball joints in various sizes. 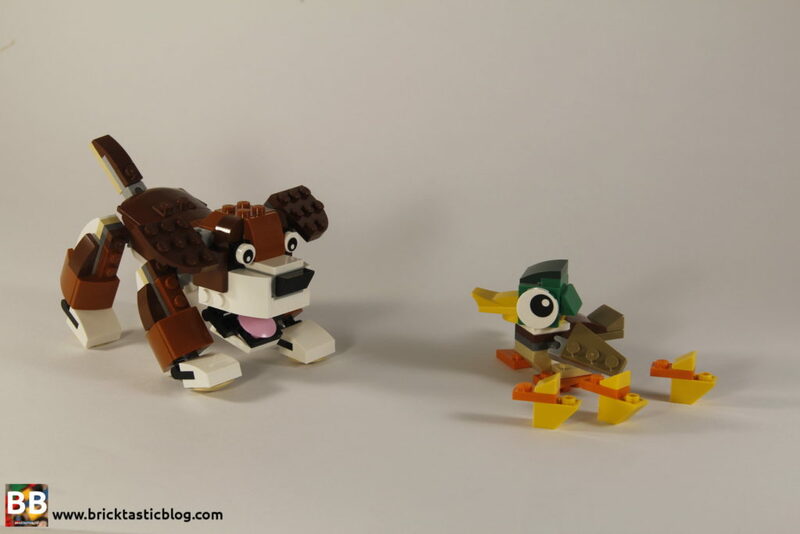 There is some decent poseability with the dog – he’s able to sit down, beg, shake, and do a bunch of other typical doggy stuff – it’s believable and very cute. 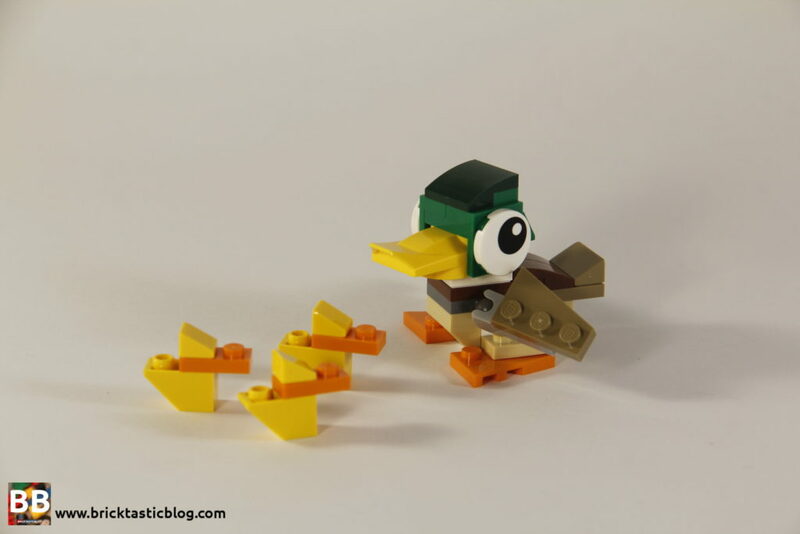 The mallard duck is only able to move it’s head and flap it’s wings, but the rest is stuck in place. This one is another one of those sets that would be lots of fun to reposition around the house. For the main model at least, it all starts with the three little ducklings. They’re about as easy as you can get, with only three small parts being used. Next up is the mallard duck. Again, it’s another very quick build and comes together in around 30 seconds. The dog, at least, takes a little more time. It starts at the logical point – the body. Ball joints and sockets are added for the neck, hips, shoulders and tail, with rounded plates sitting on top to finish it off. I like the 1×2 plate on the back so someone or something else can go for a ride! The four legs are then created, with some basic SNOT techniques in play. They’re simple and very effective. Once attached, the paws are created and added. Lastly the head is built. It all comes together very quickly, with more SNOT once again being used. These sets are great to get kids that are new to basic LEGO techniques learning about just how versatile and organic LEGO can be. Add the jaw and floppy ears, and it’s complete. This set is delightfully cute. 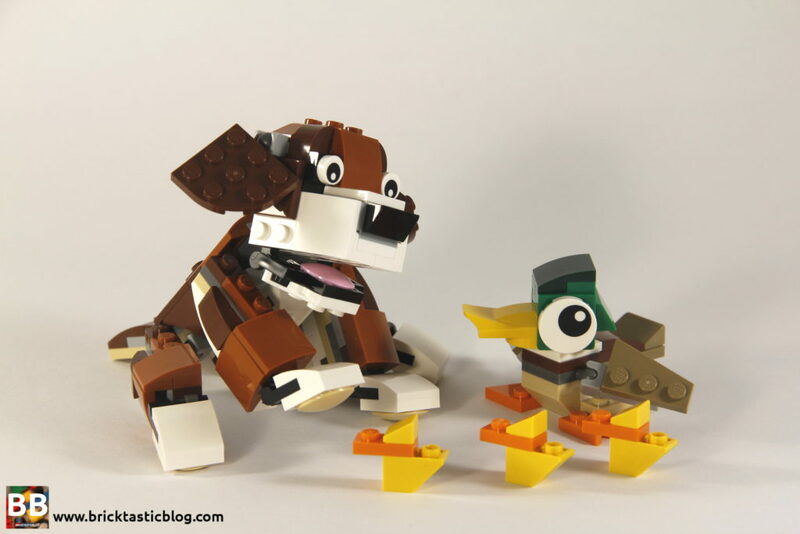 Starting with the tiny ducklings, to the gorgeously and perfectly coloured mallard duck, and finishing with the adorable dog – wow, this set is cute! I showed my wife when it was built, and she went “awww!”. The dog looks spot on. The poses are perfect and incredibly awkward and puppy-like. He’s dopey, goofy and excellent. The owl, even though I haven’t built it yet, looks great, although the squirrel is a little strange looking. For now though, I’m sticking with the puppy. Sure, it’s small, and there aren’t many parts included, but puppies aren’t big. This one is great. The size increases the cuteness factor. 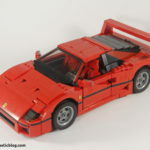 Now that the set has been retired, luckily for us, the set has dropped in price on secondary markets like BrickLink. Hooray! Many of them are going for less than AUD $20. That’s a great price for a cute little set. There aren’t exciting or rare elements, but it’s totally worth it for a set that any kids in your life will love. 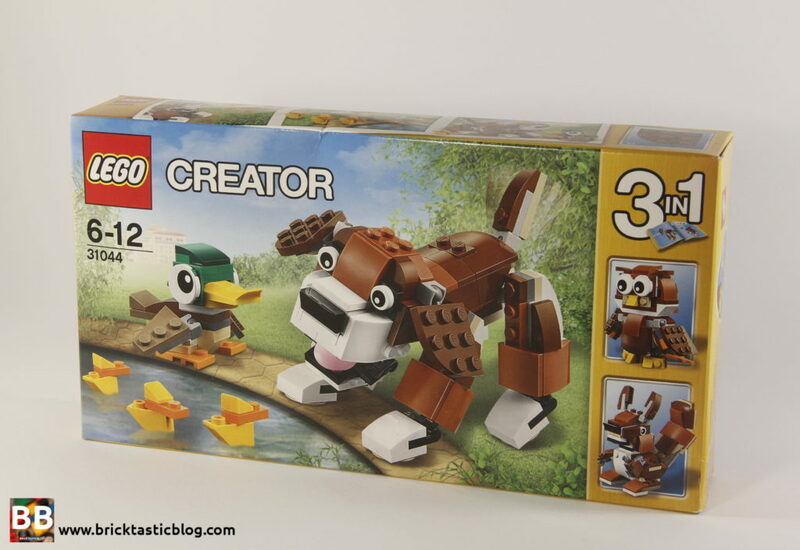 There have been a number of these Creator multi-builds of brick built animals recently, and they have come in this format of large animals with smaller buddies, as well as a multitude of others. Three of my other favourites include 31031: Rainforest Animals, 31019: Forest Animals and 31021: Furry Creatures. Line these all up in a row, and you’d have a cute little display! 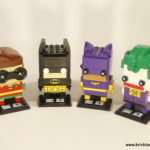 These are small enough sets to be cheap, and great for little kids. 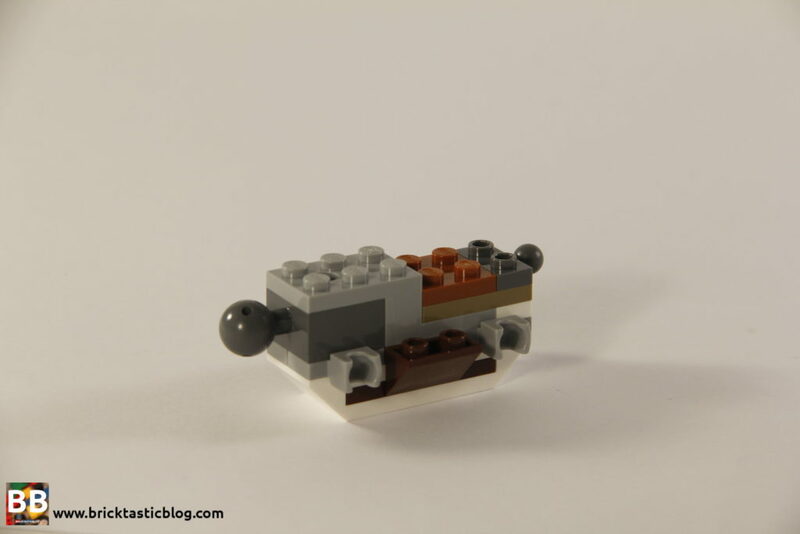 That’s it for the review this week, next week I’m taking a look at 61050: Pizza Van. 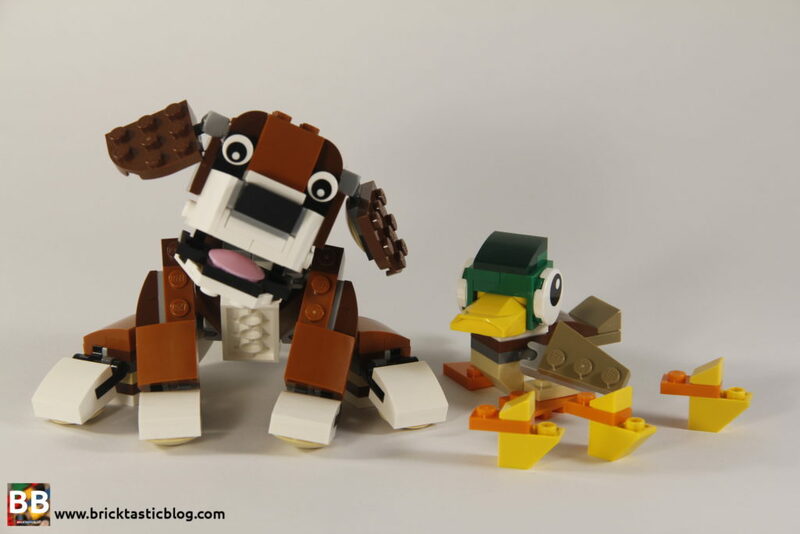 What’s your favourite brick built animal set? Let me know below.